The origins of tenmoku pottery can be traced back to Mount Tianmu in China, a region long renowned for the tea produced there. During the Song dynasty (960-1279), what the Japanese call matcha tea?made from powder produced from dried leaves?came to be widely enjoyed in China, and this fashionable new beverage was often drunk from black glaze tea bowls produced in the newly built Jian Kiln, rather than the celadon (qingci, or green glaze) bowls which had previously been commonly used. The monks of Mount Tianmu, which is pronounced tenmoku in Japanese, also came to use these Jian Kiln tea bowls. During the Southern Song dynasty (1127-1279), Japanese monks who had studied at Mount Tianmu took back to Japan examples of these Jian Kiln tea bowls. The fact that it was Eisai (also known as Y?sai Zenji), the father of Zen Buddhism in Japan, who first introduced matcha to Japan, from China’s Song dynasty, is a clear indication of the deep affinity between Japan’s tea ceremony and Zen Buddhism. The custom of taking tea became firmly established as a part of temple practice, particularly among Zen Buddhist monks, and this prompted the ceremony to undergo very unique development. During the Muromachi period (1337-1573), the tea ceremony made use of karamono, Chinese-style ceramics, for its tea caddies, and tenmoku pottery for its tea bowls. This long tradition meant that tenmoku tea bowls subsequently came to be highly prized, were treated with great care, and the pottery of choice when making offerings of tea to Buddhist or Shinto gods and in kinindate tea ceremonies, in which tea was prepared for nobles and their retainers. After the fall of the Southern Song dynasty, it was no longer possible to produce tenmoku pottery in China. Moreover, it was not possible, in terms of resources, to produce anything equivalent in Japan. As such, the value of these increasingly scarce items grew over time. A number of beautiful tenmoku tea bowls are housed in collections in Japan, including a yohen tenmoku tea bowl, a priceless national treasure, housed in the Seikado Bunko Art Museum. Other examples from the Song Dynasty can be found in the collections of the Kyoto National Museum, the Museum of Oriental Ceramics in Osaka, Ryuko-in Temple, the Tokugawa Art Museum, the Eisei Bunko Museum, the Nezu Museum, the MOA Museum of Art, and the Gotoh Museum. These exquisite pieces together make up a veritable treasure trove of tenmoku tea bowls, of great significance to the world’s shared ceramics heritage. Outside of Japan, tenmoku tea bowls can be found in the British Museum and the Victoria and Albert Museum in Great Britain, the Metropolitan Museum of Art in New York, the Freer and Sackler Galleries at the Smithsonian Institution in Washington D.C., and the Art Gallery of Toronto in Canada, as well as the Cleveland Museum of Art, the Museum of Fine Arts in Boston, the Institute of East Asian Art History at the University of Michigan, and the University of Oxford. Yuteki tenmoku is a black glaze, containing iron, used to decorate many of the items produced at the Jian Kiln in China during the Song Dynasty. 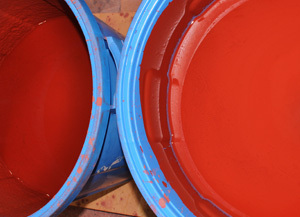 Unlike standard black glaze, made by combining pigment with hard iron and chrome oxide, for the tenmoku glaze only iron oxide was added to the pigment. After firing, the glaze would change colour at the edges, breaking into caramel brown, persimmon orange, or blackish brown. Before kilns had access to high performance technologies, it would have been extremely difficult, in terms of both the technical skill and the environment required, to create yuteki tenmoku pottery. Today, however, the findings of scientific studies on yuteki tenmoku have been widely published, and kilns have been developed which enable the potter to control the firing temperature with great accuracy. This has made it easier to ensure the right technical and environmental conditions to produce the floating oil-like spots which are characteristics of the yuteki glaze. 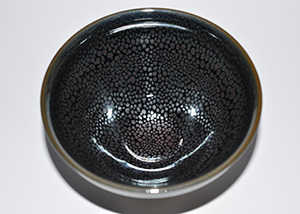 But still yuteki tenmoku presents a considerable challenge, as a number of conflicting elements must be mastered if the technique is to be applied successfully: the depth of the black tenmoku glaze, its lustre, the intensity of the brilliant silver shine of the spots, the spot colour, the way the spots scatter and flow across the surface, and the light that reflects off the glaze. 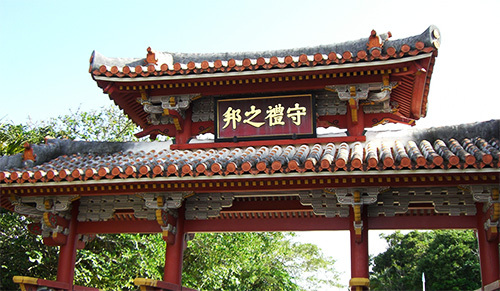 In the Ryukyu Islands, of which Okinawa is the largest, gusuku were castles and fortresses which began to be built from the 12th century onwards. In 2000, the Yaeyama Mainichi newspaper reported that tenmoku tea bowls had been discovered on Ishigaki island, one of the largest of the Yaeyama island group in Okinawa prefecture. Previously, an exhibition of ancient Yaeyama-yaki pottery had been held in Urasoe City Museum, on the main island of Okinawa. Haruhiko Kaneko has spoken of his amazement on seeing the Yaeyama-yaki: “I was seeing a style that was quite different, quite unique, from ceramics from other areas, made using the sort of techniques seen in Koishiwara-yaki pottery (from Fukuoka prefecture) and Onta-yaki pottery (from Oita prefecture) kiln sites, such as tobiganna (a slip decorating technique, known as a “chattering slip”). It points to the likelihood of considerable exchange of skills between kilns in the north of Kita-Kyushu, on the southernmost of Japan’s four largest islands, and those in the Ryukyu islands and in the Yaeyama region, both now part of Okinawa, via the region of Satsuma, which was located in present-day Kagoshima prefecture. On seeing this, I came to realise that it is not just by simple coincidence that today I am making tenmoku tea bowls here on Ishigaki island. This is supported further by the fact that I am able to source the materials needed for tenmoku on the island, too”.